Get into the holiday spirit with good friends, shopping and beer at Dovetail Brewery’s Second Annual Holiday Market. The event features craft artisans selling a variety of goods that make perfect gifts for everyone. CHICAGO, IL, November 10, 2017 /24-7PressRelease/ — Get into the holiday spirit with good friends, shopping and beer at Dovetail Brewery’s Second Annual Holiday Market. The event features craft artisans selling a variety of goods that make perfect gifts for everyone, from noon to 7 p.m. Saturday, December 16 in Dovetail’s upstairs barrelhouse loft (1800 W. Belle Plaine at N. Ravenswood; 773-683-1414). Shop until you drop, and then take a seat downstairs in the taproom and recharge with any of Dovetail’s highly praised beers including their Holiday Bock. The Holiday Bock is stronger than your typical lager, with a robust malt character and a darker hue. Noble hops balance but do not get in the way of the malty flavor and slightly candied-fruit sweetness. This beer is brewed for merrymaking. It’s a 100% barley malt lager with reddish tones from the generous addition of caramel malt. At 6.9% ABV, it’s a darker, higher strength beer perfect for colder weather, sure to warm you after a snowball fight or bring more happiness to a lively party. Supplement tasty brews with snacks from the bar and favorite Chicago food truck Bruges Brothers. In addition, Sausage Konig will be selling sausage baskets and currywurst in the barrelhouse loft. Abbey Brown creates handmade natural Olive Oil soaps, soothing body oils, relaxing bathing essentials and homey candles. All products are crafted in house and are infused with homegrown herbs and botanicals with pure essential oils. Visit their website to learn more about the products as well as upcoming classes and events. Believing that everyone should own a special, unique piece of art that they love, Kim Amati creates one-of-a-kind works of art that catch people’s attention, makes them laugh or just gives them a moment of peace. Visit her website to learn more. Rooted in Chicago’s long history of first-rate craftsmanship, Chicago Wood & Leather hand makes timeless pieces built to last. Using high quality products and a combination of new and reclaimed materials, each CW&L product has its own unique character. Check out their work on Facebook. Hail To The Ale is a blog and shop which is passionate about the intersection of art and craft beer. The shop features handcrafted beer-themed cards, jewelry and art. Follow them at www.hail2theale.com. Illustrator Matthew LaFleur delivers amusement though his cute and goofy artwork. A jack of all trades, Matthew did the illustrations for the children’s book, The Toothless Fairy, as well as beer labels for Chicago craft breweries and brewing suppliers like Arcade Brewery, Middle Brow Beer Co., Transient Artisan Ales, Sketchbook Brewing Co., Dryhop Brewers, the Illinois Craft Brewers’ Guild, Hop Butcher for the World, Brew Camp, and North Shore Cider Co. You can also find his work in the Wall Street Journal, the American Bar Association, Fused Muse Ensemble, ABV Chicago, ALT Imagery, Literature & Libation blog, W. W. Grainger, Sterling Publishing and MENSA puzzle books. Get your own masterpiece at Dovetail’s Holiday Market! Davud Rzany’s creates colorful, abstract and textural masterpieces. Stop by his booth at Dovetail’s Holiday Market and find the perfect piece for your home! Using Polaroid SX-70 manipulations and digital infrared photography, award winning Chicago-based photographer, Rossana Reformado takes stunning images to create beautiful, one of a kind prints, coasters, wood blocks, magnets, ornaments and pendants. Most Re4mado products are created time zero film, which was discontinued in December 2005, making the products rare and unique. View the products online. Creating handmade crochet accessories to keep Chicagoans warm all winter long, Sundae Crochet Co. has something for everyone. View their products online. We Are Lions is a social enterprise dedicated to providing opportunities for individuals with disabilities through art and entrepreneurship. Offering entrepreneurs 50% of profits, the organization allows them to transform their daily passions into sustainable sources of income. We Are Lions sells t-shirts, leggings, throw pillows, curtains, phone cases, bags and more. Shop the collections online. Beginning as a blog sharing stories about beer tastings, brewery visits and beer-centric events, Worth 1000 Beers visually records her experiences with beautiful illustrations. View the whole collection of her prints, plus a few original surprises relevant to pop culture, of these illustrations, and home accessories on her online store. 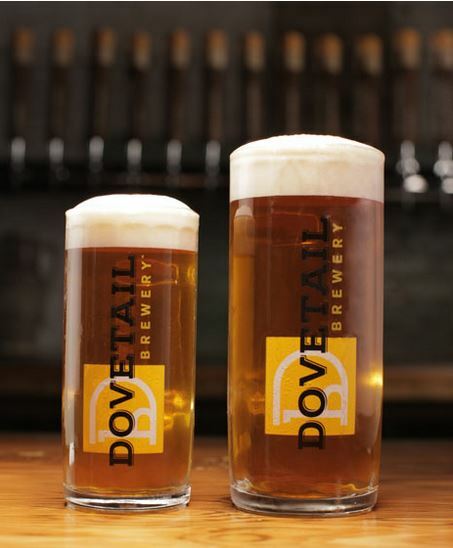 Dovetail Brewery, located at 1800 W. Belle Plaine in Chicago, Illinois, is a craft brewery owned by master brewers Hagen Dost and Bill Wesselink, specializing in delicious, balanced beers brewed using traditional German and Belgian brewing methods. Signature beers include unfiltered German-style lagers, traditional Hefeweizen, Rauchbier and Lambic-style sour beers. Dovetail Brewery also produces a variety of special seasonal beers. Taproom hours are: Tuesday- 12 pm – 10 pm; Wednesday- 12 pm – 10 pm; Thursday- 12 pm – 10 pm; Friday- 12 pm – 11 pm; Saturday- 11 am – 11 pm; Sunday- 12 pm – 8 pm. For more information about Dovetail Brewery, please visit the brewery’s website at http://dovetailbrewery.com, their newsroom at http://www.newsline360.com/dovetailbrewery or contact Bill Wesselink or Hagen Dost by email. For information about private events and Dovetail promotions, please contact Adrianne Dost. For additional information, call 773-683-1414.